The United Association of Journeymen and Apprentices of the Plumbing and Pipe Fitting Industry of the United States and Canada (UA), represents approximately 340,000 plumbers, pipefitters, sprinkler fitters, service technicians, and welders in local unions across North America. The UA also honors a federation agreement with both the Australian Plumbing Trades Employees Union and the Irish Technical, Engineering Electrical Union. The UA has been training qualified pipe tradesmen and tradeswomen longer than anyone else in the industry. They provide the premier training programs available in the industry today, including five-year apprenticeship programs; extensive journeyman training; a comprehensive, five-year instructor training program; and numerous certification programs. The UA helps their signatory contractors grow their market share by identifying new opportunities, providing support, and connecting them to the safest, most skilled and most highly trained workforce in the industry. 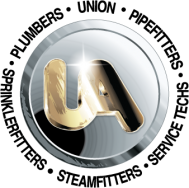 The UA promotes the highest standards of qualifications and training in their industry so that their members have the skills and knowledge they need to be competitive. They are committed to continuously recruiting and training future generations of world-class piping professionals. They believe that every worker has a right to go home from the job in the same shape as when he or she arrived at the workplace. The UA is committed to protecting the safety and health of their members, contractors, project owners and the communities in which they work. UA members are highly motivated and productive in part because they enjoy fair wages and benefits. Fair wages along with self-funded health care and retirement plans are the best guarantee that their members and their families get the quality of life they deserve. The UA believes fostering lasting relationships with their industry partners, including contractors and project owners, increases job opportunities for members and results in more successful projects completed on time and on budget.